For so many of us, the winter months force us to take time off from one of our passions. Not only is it frustrating to choose between shivering throughout 18 holes or sitting at home, but our skills can certainly start to decline. After spending months perfecting your putting routine and or getting used to a new set of putters, wouldn’t you like to keep up your momentum all year long? It’s with this sentiment in mind that we’ve developed the Winter Marksman League, a way for players across the world to stay sharp on the putting green and have some fun with their friends. With the ability to win prizes and a way to bring your disc golf community closer together, we’ve developed an easy to follow system for groups to enjoy. Running your own Winter Marksman League is pretty simple, and since registration just opened up on November 1st, you’ll want to make sure you submit all of your information sooner rather than later. Depending on the size of your league, you can choose from a range of packages, with varying quantities of Marksman baskets and 6 Winter Marksman League stamped Moonshine Maidens for each week’s winner. We also have Prime and Classic putter packs available to help offset the registration costs. Leagues can begin as early as December 1st, with time to register until January 12th. All league play must conclude by March 3rd, giving people plenty of time to get a space secured and put the word out to their community! 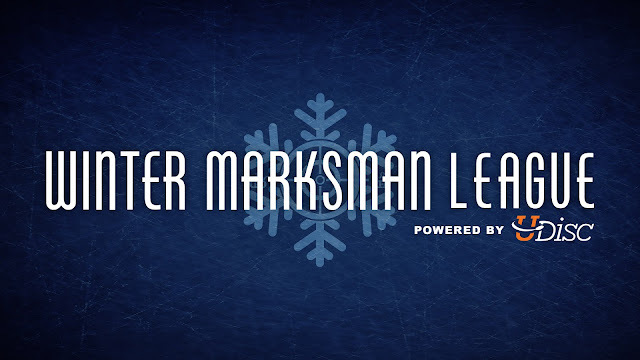 The Winter Marksman League has grown by leaps and bounds, and we are so excited to have partnered with UDisc in order to make statistic tracking available for all of our leagues. By implementing a global leaderboard system, you can see how your putting skills compare with your friends and family anywhere else in the world. Not only do these stats help League Directors run their event smoothly and efficiently, but numbers generated from the 2017/2018 Winter Marksman League gave us some pretty exciting insight. Across the six week league, the results show that people not only maintained their putting ability but actually grew their skills. Those who have participated in the Winter Marksman League in the past probably know how much fun it is, but the thought of competing against some of the best putters in the area may have been a little offputting for newer disc golf fans. This year we’ve changed that, as League Directors now have the opportunity to host multiple divisions! Interested in running a Winter Marksman League of your own? Curious if there’s already one in your area? Visit our information section that details exactly how it works, allows you to look up currently registered leagues, and gives you the opportunity to register your own Winter Marksman League. There’s no reason that colder weather should keep you from improving upon your putting skills, so get some friends together and sign up today!